Michael D'Aulerio smiles as he runs across Florida from the Gulf of Mexico to the Atlantic Ocean. The Cross Florida Route 40 Romp was a 116-mile exceptionally painful yet uniquely gratifying journey. The repetitive uphill running, radical temperature changes, constant vehicle traffic, bear warning signs, random wild coyotes, excessive pavement pounding, and the exclusion of aid stations set the stage for one gutsy endurance extravaganza. It pushed my physical being to new heights and placed my psychological being through a roller coaster ride of emotions. During race week it seemed as if everyone I encountered was plagued with a winter cold. My baby boys, my wife, and even my dog were all sick. It was unavoidable. I spent most nights that week on the couch with my two baby boys coughing and sniffling in my face as I sat there over-trained and with a compromised immune system. In any case, I jumped on a plane that Thursday afternoon and headed south to Florida where everything was going according to plan until Friday morning at 3:00 a.m. when my nightmare came true and I woke up shivering with night sweats—a fever almost 24 hours before the race! I spent the day sleeping in the car as my father-in-law drove around picking up his common cold cocktail cure of vitamins. Miraculously, the next morning I woke up in a puddle of sweat and to my surprise my fever had broken! I was ecstatic and humbly grateful for my health. 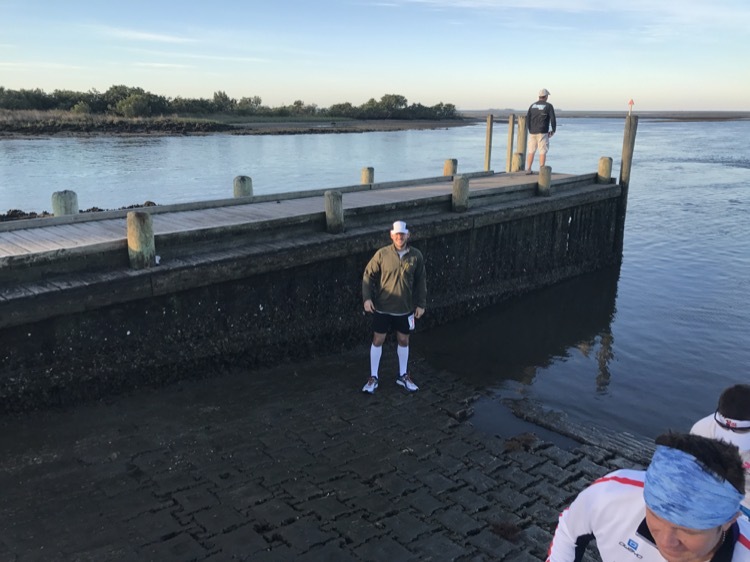 Still feeling somewhat sluggish, I dressed myself, drank a bottle of water and headed to the swampland streets of Yankeestown on the Gulf of Mexico ready for the longest race of my life. It was time to run. The six of us participating in the race dipped our feet into the Gulf, walked over to the starting line, and off we went. 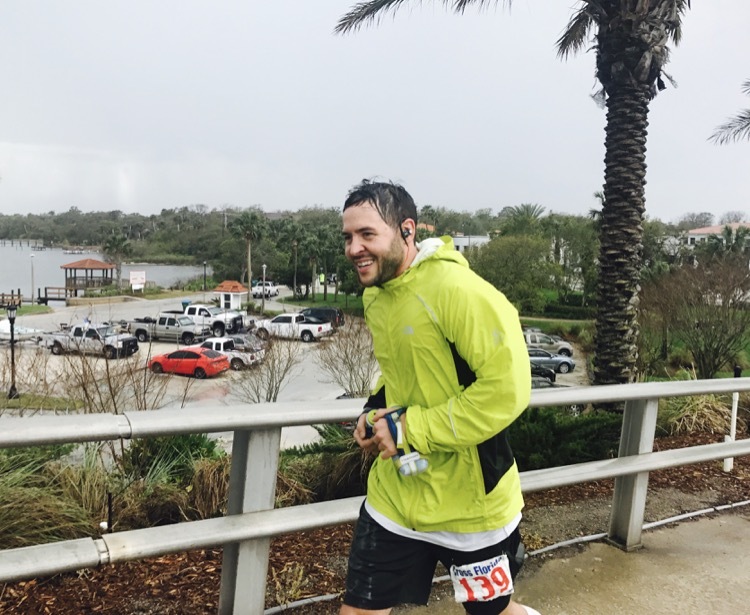 Ripping through the swamp-surrounded streets, I kept an eye out for any alligators that might want to end my race short. A few miles into the race the road split and I accidently ran down the wrong street. Luckily, I quickly realized the error, turned around, and continued down Route 40. At the start of the race where we put our feet in the Gulf of Mexico. Mother Nature quickly kicked up the thermostat. After passing multiple cows and horses along the road, I reached the 20-mile mark where temperatures reached 80-plus degrees. The sun’s rays shot down from the skies above with zero available shade. The 20-mile mark was also the location of the only turn during the race. From this point, it was one straight, long and grueling shot toward the beach and into the Atlantic Ocean. The remainder of the race took place along a traffic-filled ascending road with zero aid stations. Checkpoints were at miles 20, 40, 60, 78, and 98. My father-in-law crewed from a rental car we had picked up at the airport. I ran exclusively drinking coconut water for approximately 40 miles before adding some food into my fueling mix. Fueling all-naturally doesn’t necessarily promote the fastest pace but it sure promotes the healthiest one. Later in the day everything was still moving along smoothly as the sun began to set and I continued down the forest-surrounded road. The night was brisk and the moon bright as I ran towards traffic through the wooded area. As the sun set completely, I was surprised to see a large yellow sign warning of bears for the next 33 miles. I didn’t know what was worse, having to keep an eye out for bears for 33 miles or knowing that after 33 miles of running I would still be nowhere near the finish line. Fortunately, there were no bears spotted on race day; however, I did see a few wild coyote. As the night became late, my body became tired. I could barely keep one eye open. My stomach became nauseous and the chafing between my legs was becoming worse. An adjustment was needed quickly in order add some life back into my sleep-deprived, energy-drained, tired-out body. During my next refill, I switched to vegetable broth for fluids and strictly almond butter for food. The added protein and reduction in sugar helped with the nausea and kept my body fueled through the late-night hours. After trying not to throw up on my shoes for the past few hours, the nausea began dissipating. My pace increased exceptionally as I began sprinting through the chilled wind of the night, praying for the moon to make its way across the sky. At this point the chafing began to break past the threshold of manageable and my father-in-law made a trip to stock up on baby powder. Throughout the remainder of the night, I ran with my handheld in one hand and baby powder in the other, an ironically symbolic situation for an ultrarunning dad. Later, the sun finally began to rise as my internal clock shifted to the new day and restored my energy. Somewhere past the 24-hour mark and over 100 miles in, I began to lose it. Running on the same road that looked exactly the same for over 100 miles was mind-bending. However, quitting was not an option; it never is and it never was. I came way too far, thinking back to those 30-mile 3:00 a.m. freezing-cold training runs back in the Northeast. Fortunately, way past the physical and somewhere just beyond the mental, we have the spirit, and that’s what kept me moving to the finish. With seven miles to go and the possibility of finishing under 30 hours, I began to pick up the pace substantially—not bad for a pair of legs that just ran 109 miles. Even with the sun beating on my head, causing my body to overheat, I kept moving forward. Then all of a sudden it began pouring down rain. Traffic filled the streets after an accident, sirens blared, horns beeped, and people yelled. I pushed through the commotion to just get this thing done and over with. Running over the bridge about a mile from the beach where the finish line was. Finally, I began approaching the beach area. Across the railroad tracks and over the bridge I went. The bridge was steep but it did not matter. I started spraying water from my handheld in the air and yelling with excitement. 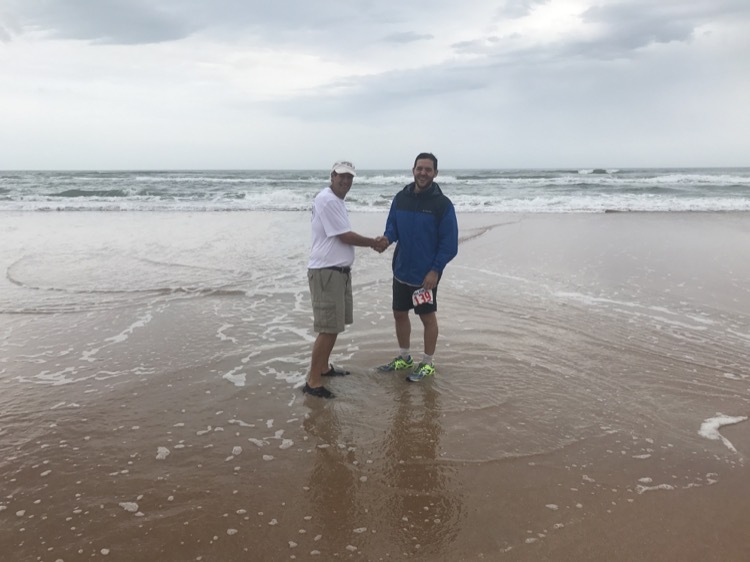 As I arrived at the finish line I was ecstatic, having completed 116 miles from the Gulf of Mexico to the Atlantic Ocean. 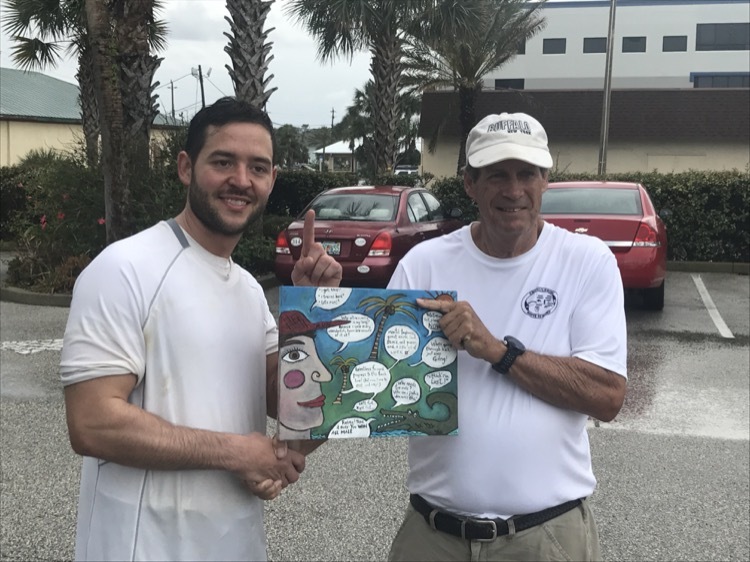 I asked the race director my time as he pulled a painting out of the trunk of his car. It was a trophy for the first place finisher, and to my surprise the first place finisher was me! With the race director and first place finisher award. The finish line always brings a sense of accomplishment; however, there’s never been a finish like this in the 70 ultras I’ve run thus far. Ultramarathon running to me is a journey. Each finish line is a new arrival towards something greater, towards the next faintly admirable mysterious object in the distance. It is through relentless forward motion that faint object becomes obtainable, and that new obtainment becomes a dream come true. And wow, the cold water of the Atlantic Ocean felt phenomenal on my intensely sore feet. With the race director in the Atlantic Ocean at the finish. Congrats Mike. What an incredible journey. You have to be so proud of yourself. This was quite the accomplishment!!!!! I ran this race the year before. its a great old school race from years gone by. loved it.